Established in 1980, Los Angeles-based Natrol has over 35 years of experience under its belt. Though acquired by Aurobindo Pharma in 2014, the company has nevertheless continued to be a leading manufacturer of vitamins and supplements. Natrol’s product line makes use of a variety of ingredients—botanicals, herbs, multivitamins, and more—to support specialty and sports nutrition; as well as health, wellness and beauty. Committed to empowering and meeting the needs of its consumers and listening to their suggestions, Natrol was built on the idea that you need to “own your health”. The company’s products are said to be both innovative and cost effective. Natrol products are easy to find—as they are widely distributed in the US and internationally—and can be purchased in both physical stores and online retailers. Apart from Natrol Sleep ‘N Restore, the company manufactures eight other Melatonin-based sleep support products; though the former is by far the most complex. Many of the others are just Melatonin in different forms—liquid, gummy, tablet—or Melatonin with one or two other ingredients. True to its name, Natrol Sleep ‘N Restore is both a nighttime sleep aid and a powerful antioxidant blend in one comprehensive formulation. While this dietary supplement is suitable for anyone having trouble sleeping—with a few exceptions, which we will get to shortly—it is particularly for people suffering from tiredness and sleep deprivation due to a hectic schedule. Apart from encouraging your body to settle into a regular sleeping pattern, Natrol Sleep ‘N Restore also helps your body deal with oxidative damage brought on by a stressful lifestyle. The idea is to promote restorative and deeper sleep that leaves you feeling recharged and revitalized in the morning when you wake up. It is important to note that Natrol Sleep ‘N Restore—like every other dietary supplement—is not intended to cure or treat any disease, or prevent any symptoms thereof; as it is not actual medication. However, it is equally important to talk to your physician about Natrol Sleep ‘N Restore before adding it to your day to day routine, especially if you are: under 12 years of age, pregnant, lactating, or already taking prescription drugs for a preexisting condition. Dietary supplements may affect you negatively or cause undesirable interactions with maintenance medication. Natrol Sleep ‘N Restore is 100% drug-free, non-habit forming and vegetarian. It is sold in tablet form in blister packs. Among its active ingredients, the following are to help you fall asleep faster and stay asleep for longer: Calcium, L-glutamine, Melatonin, and Valerian Extract. While Calcium is not typically thought of as a sleep aid, it has been shown to calm the nervous system and promote sedation; this may be why warm milk is a well-loved home remedy for when you can’t sleep. 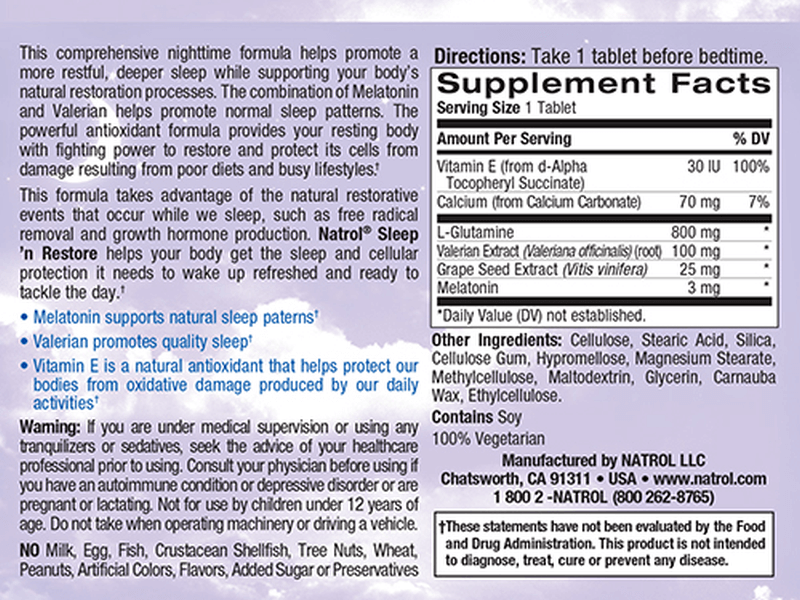 In Natrol Sleep ‘N Restore, Calcium is said to support your body’s production of Melatonin. Valerian, on the other hand, is one of the most popular and potent sedative herbs; it has been used as a herbal sleep aid for centuries in many cultures. Along with L-glutamine—an amino acid that stimulates the pituitary gland in order for it to produce the human growth hormone while you sleep—Valerian is added to Natrol Sleep ‘N Restore to enhance the quality and state of your slumber. Of course, on top of this all is a healthy dose of Melatonin, the central ingredient; because it is both sleep regulator and antioxidant. Vitamin E and Grape Seed Extract are added to increase protection from oxidative damage by helping to prevent tissue damage and cell death. Natrol suggests ingesting one tablet half an hour before bedtime. As with most sleep aids, it is not advisable to operate machinery or drive any sort of vehicle after intake. If one tablet is not sufficient to induce a feeling of sleepiness, you can take a second tablet—but according to Natrol, that should be the maximum dosage. 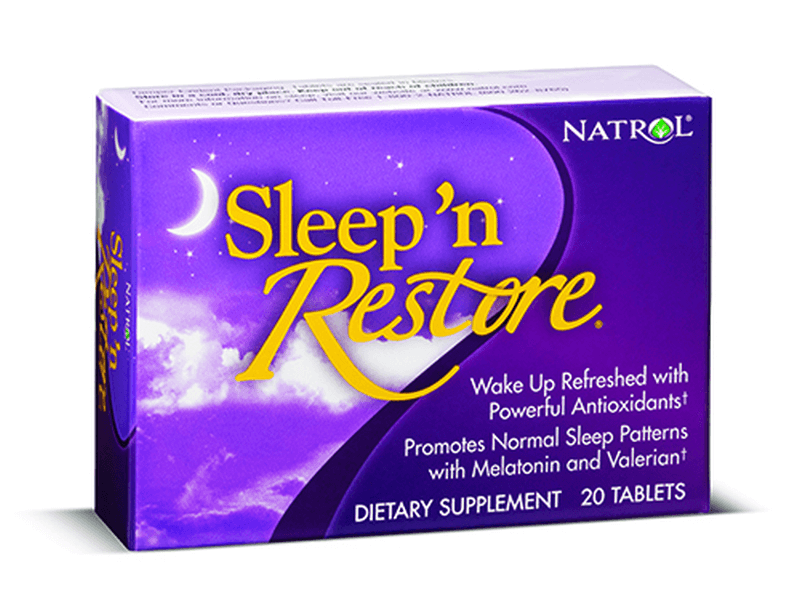 Natrol Sleep ‘N Restore is not a prescription sleeping pill, and it is mild enough that it can be used by young teens. However, if you are not currently under stress or experiencing a hectic and fast-paced lifestyle, a less complex supplement may be better suited for your purposes. After all, even Natrol itself has nine different products for sleep support; that should be a good indication of how different formulations are better for different nuances of the same problem. If you simply want to sleep better, maybe Natrol Melatonin Gummies would be more appropriate; you wouldn’t even have to take it with water. On the other end of the spectrum, if you are suffering from very extreme levels of stress and anxiety, Natrol Stress & Anxiety Day & Night may be a better fit. The company is very clear on this issue on the official website: There are no reported side effects from using Natrol Sleep ‘N Restore. It is probably a good idea to look up each individual active ingredient and evaluate them considering your medical history and possible reactions and sensitivities, though; this is something that your doctor will likely do, if they are not familiar with the dietary supplement. Valerian has been known to cause vivid dreams, as well as sluggishness and drowsiness after waking up from the sleep it induces. Large doses of it do come with a multitude of possible side effects; but the amount is controlled in Natrol Sleep ‘N Restore. It wouldn’t hurt to avoid using the product in conjunction with other proprietary blend sleep aids, as it may have an unintended or compounded effect; or stop use completely weeks before a major checkup or surgery, as it can affect medical results and interact with other prescription relaxants and sedatives. The official Natrol website does not have its own online store, but it does have a built-in store locator; which you may not even need to use. Natrol products are available practically everywhere. You can go to any CVS, Target, Walgreens or Walmart store—or their online equivalents—and find Natrol Sleep ‘N Restore. Of course, it’s also available on Amazon. The point is that Natrol products are some of the easiest vitamins and supplements to find, online or otherwise. It must help that the brand is established and trusted, and the product are so affordable compared to some competitors’ offerings. Unlike many new startups that are bereft of experience and a consumer base that has tried and tested their products for years, Natrol is decades into the game and has consistently come out with helpful offerings and dealt with news and press—bad or good—with finesse and professionalism. In conjunction with encouraging consumers to “own their health”, Natrol focuses on five strategic principles: cost effectiveness, customer service, innovation, people and quality. Natrol’s quality assurance program is purported to be industry leading and very extensive and exhaustive. It includes rigorous quality checks at different points in the manufacturing process. For example: the company closely screens suppliers and makes sure they have proper qualifications to deliver the best raw ingredients. Natrol has consistently achieved the highest ratings from the Natural Products Association (NPA), which is the oldest and largest nonprofit organization in the US representing manufacturers and retailers of the industry. Like all dietary supplements, efficacy depends on the user; either it works or it doesn’t. 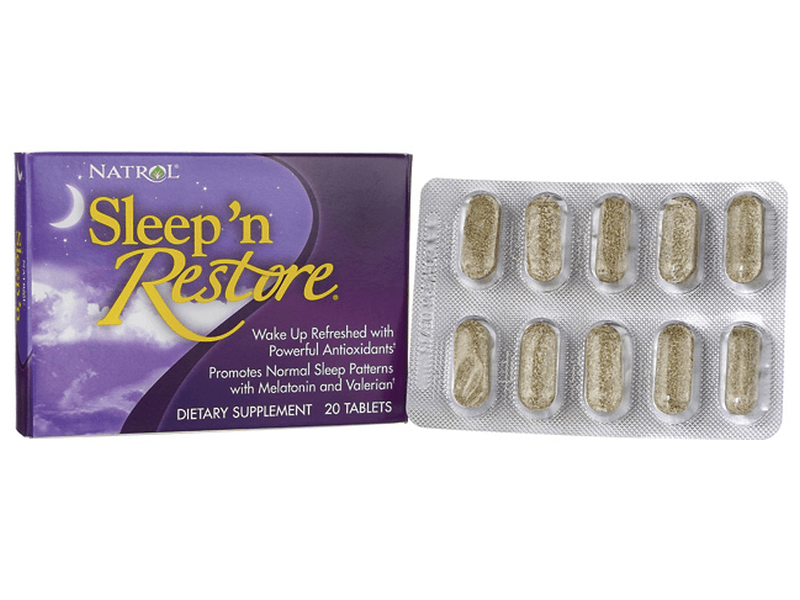 Natrol Sleep ‘N Restore doesn’t have customer reviews on the the company’s official website, but on online retailers like Amazon, the comments and reviews are overwhelmingly positive. Many people noted that they have been using the product for years without any complaints or side effects observed; although it seems that people do experience building up a tolerance and needed a higher dosage after a while. A handful of more critical customers noted that while Natrol Sleep ‘N Restore helps them sleep, it doesn’t stop sleep interruptions in the middle of the night; and a few found that it didn’t help them sleep at all. Of course, there’s usual dietary complaint when it comes to dietary supplements for sleep support: the smell! This seems to be an almost unavoidable issue. Worth mentioning here that since the product comes in blister packs and not in a bottle, as long as they are kept in the packaging the unpleasant smell should not pose a long term nuisance. There is no return policy or guarantee, probably because Natrol Sleep ‘N Restore is so affordable and the company does not have an online store of its own to handle direct consumer shipping and ordering. If you want to know more about Natrol Sleep ‘N Restore, though—or have questions about its formulation, a health concern, a suggestion or a general complaint—Natrol can easily be contacted through a telephone hotline and an online form on the official website. Price points will not be the same everywhere. For example, as of this writing: On CVS, it is available for $8.29; on Amazon it’s currently almost half that cost at $4.15. Natrol Sleep ‘N Restore is sold as a package containing 20 tablets; which is good for 10-20 days of regular use, depending on your needs and tolerance. Visit Amazon & Find Natrol Sleep ‘N Restore Deals Now! Considering that it will likely cost you less than $10—or even less than $5, depending on where you find and purchase it—to try Natrol Sleep ‘N Restore, there’s little to lose by seeing if this works for you. That there’s no money back guarantee is not even an issue anymore considering how little you will actually spend for it. However, as we repeat again and again in every review: Please do consult a doctor! Preferably, one that you trust and one that knows your medical history. Do not take Natrol Sleep ‘N Restore without talking to a healthcare professional about it first.